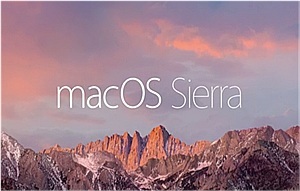 The major update to Apple's Mac OS X, is no more OS X 10.12, instead, it's named macOS Sierra. The brand-new desktop operating system comes with Auto Unlock, Optimized Storage, Siri, Universal Clipboard and many more. 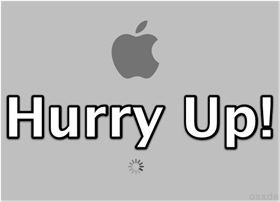 But as is the case with each Mac operating system update, some users will painfully encounter a slew of problems/issues, like download error, Mac compatibility issue, macOS Sierra upgrade failed, install stuck, slow Mac performance etc. This list of macOS Sierra problems and solutions will show you how to fix the most common problems with MacBook, iMac and other Apple computers after uploading to the new OS. 2. Start iTunes in Safe Mode to troubleshoot this error. 3. Update iTunes to the latest version 12.5. 4. Turn off Wifi -> go to iTunes menu -> Store -> Sign Out -> turn on Wifi and open iTunes again. To be frank, iTunes is blamed for complicated sync operation, and constantly data loss after sync. If you are fed up with this iTunes issues with macOS Sierra, here is the best iTunes alternative Mac for you. MacX MediaTrans is the best alternative to iTunes that can sync music, photos and videos from iPhone iPad to Mac, and reversely. No longer worry about the macOS Sierra update problems. No tedious iTunes sync anymore. 1. Get rid of any antivirus software installed on your Mac. 2. Make sure you have created a Time Machine backup on hard drive. 3. Press the power button and hold down the Shift key. 4. Try updating software in Safe mode. 5. Switch from wireless connection to hardwired connection. If you also encounter similar iOS 10 update issues, follow to solve iOS 10 problems here. 1. 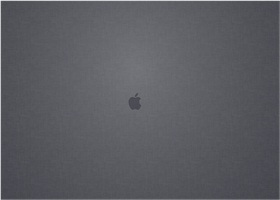 Restart the Mac and hold down Command, Option, P and R to reset the NVRAM. 3. Try to boot Mac in Safe Mode and make sure you Mac has at least 9 GB of free space. 4. To avoid any problems updating from El Capitan to macOS Sierra, remove all third-party Kexts and extensions. 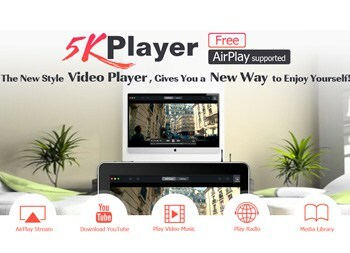 Having QuickTime player not playing movies properly, or QT app crashes on macOS Sierra problems, find the fix here: a 100% free, safe and powerful player: 5KPlayer. It solves any known playback issues as it supports almost all the video formats, HD, 4K, Bluray, 3D, VR, DVDs etc. 2. Reset PRAM at startup. 3.Remove plugins, for example for Mail apps, remove Mail plugins installed in /Library/Mail/Bundles and ~/Library/Mail/Bundles. 4. Hold down "option + command" when you laugh the app. 5. 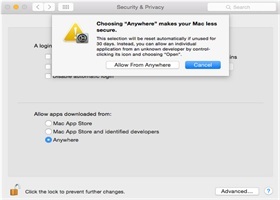 Try the "Allow applications downloaded from: Anywhere" setting in the "Security & Privacy" System Preferences. 1. 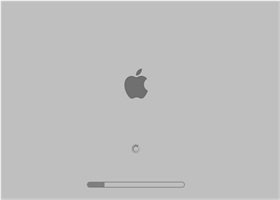 If everything on Mac is slow, first try to restart Mac to see if it helps. 2. Reduce RAM usage or upgrade RAM to make the computer run faster. 3. Try to delete log file manually in the following folder (Command + Shift + G): ~/Library/Containers/com.apple.mail/Data/Library/Logs/Mail/. 4. Repair disk permissions with Disk Utility. 5. Run SMC and PRAM resets on Mac. 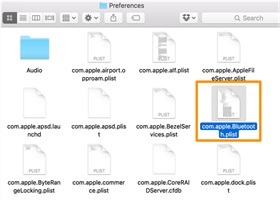 * preferences.plist > Move them to the new-created folder and reboot Mac. 2. Power off/on your router and check if it needs any firmware updates. 3. Reboot your Mac in Safe mode and reboot it again. 4. Deselect Proxies: System Preference > Network > Advanced > Proxies Tab; under "Select Protocol", uncheck any box if checkmarked; click "OK" then "Apply". After successfully update to macOS Sierra, users will still have issues with Fuji playback videos in certain formats in QuickTime like mkv, flv, mts, wmv, avi etc. To fix the problems with video playback, you can follow the suggestions below. Turn to a video converter like MacX Video Converter Pro, which is so far the fastest video converter for Mac. It solves videos not playing on macOS Sierra issues on MacBook Air/Pro, iMac etc by converting among almost all the 4K/HD/SD video formats without losing quality. 1. Delete Bluetooth Preferences: In OS X Finder, press Command+Shift+G > find type /Library/Preferences/ > find com.apple.Bluetooth.plist > delete the file and shut down Mac. 2. Reset SMC & Power Functions. 3. Power off the system, disconnect all peripherals, and power on after 2-5 minutes. 1. Turn Off Spotlight Indexing as it keeps using significant battery. 2. 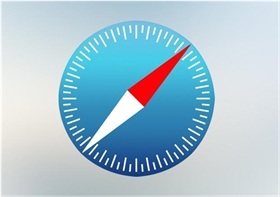 Switch browser to Safari from other third-party browsers. 3. Adjust the Energy Saver settings. 4. 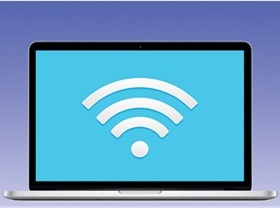 Check your Wi-Fi settings and disable Bluetooth. 6. Reset the System Management Controller. 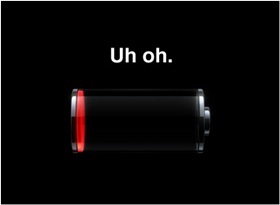 Some users also report iPhone fast battery drain, here's how to save iPhone battery. 1. Deleting the email account in preferences, and creat a new account to see if that fixes the issue. 2. Go to Preference and select Accounts > select Account Information > find SMTP Server > select option "edit STMP server list" > reset all the settings in the list. 3. Uncheck mail extensions at Mail Menu > Preferences > select Extensions. 1. Restart Mac (remove SD card and unplug hard drive before you restart) to see if it fix this common macOS Sierra problem. 2. Try to mount the Hard Drive in OS X Finder. 3.. 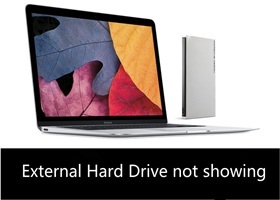 Try third party drovers, TEXERA NTFS and PARADON NTFS to connect the external disks to Mac system. 4. Try to reset the SMC and the PRAM on your Mac. 1. Clearing the Safari history and cache: find Library./Caches/com.apple.Safari/Caches.db and move it to the trash. 2. Temporarily switch Safari to third-party browser such as Chrome, Firefox etc. 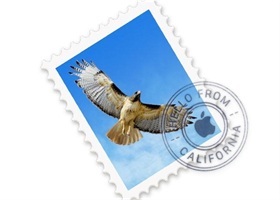 As a new operating system for Mac, it's a common occurrence to have some problems with macOS Sierra and Apple will strive to solve any known problems with new release. And we will try to gather helpful fixes before the official fix is released. This list of 10.12 problems and solutions, as well as the latest Mojave update problems and fixes will be continuously updated to cover any latest issues. 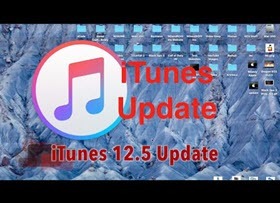 We also gathere all the iOS 12/11/10 update issues tips for Apple users.